Linda Lawson: "Love, love, love this shop! These are some of the "sweetest" ladies. Lots of cute stuff to look at and tasty cupcake treats!" Tracy Parsons Curtner: "what a cute neat shop!" Carol Zimmerman Pfeiffer: "This is a great little shop. Good conversation, yummy cupcakes (my favorite is the triple chocolate), other sweet treats - Caroline's Cookie Jar cookies, and beautifully handcrafted items. Drop in; you won't be sorry you took the time." Tyler Jones: "Fantastic store, great people and great cupcakes!!" Maria Calia: "The sweets are delightful and the staff is wonderful." 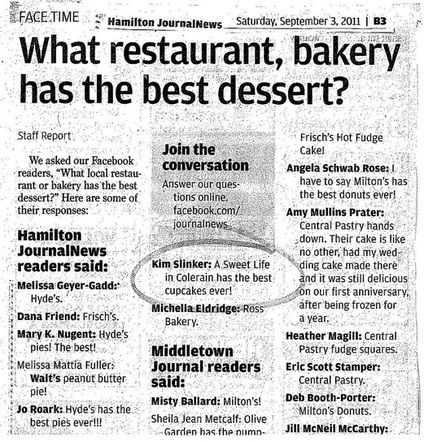 Erika from weddingwire.com: "Got cupcakes for wedding here-SO delicious! Best deal in town and very nice, helpful staff. Not only best price but best that I tasted. 5/5"